Abandoned by her father and neglected by her mother, Sheila McGee cannot wait to escape the drudgery of village life in Northern Ireland. Working in the local linen mill and living off the reluctant charity of relatives is well enough for her ma, but Sheila craves a place where she will get the attention and love she deserves. London may be under attack by the Germans, but it still offers far more opportunity for a clever and attractive young woman such as herself. Winning the title of Linen Queen doesn't just validate her self-confidence; the prize money provides the funds to get away. Though she's ready to leave immediately, her Ma has other plans for her money and it seems her looks aren't enough to get the necessary papers to enter England in the midst of the war. Deferred but still determined, Sheila continues to look for a means of escape, and finds it in the arrival of American troops who set up base in her home town. At first Sheila sees only diversion and excitement in this new situation, and then maybe a different path to freedom in the form of an attractive Jewish-American army officer named Joel. But despite her intentions, Joel's affection and wisdom begin to affect Sheila. The arrival of a street-wise young evacuee from Belfast named Grainne, and her childhood friend, Gavin, further complicate her plans. As the war moves steadily closer to those she has grown to love, Sheila will not only confront more abandonment and loss, but also find true strength, compassion, and a meaning for her life outside of herself. Are you tired of female character leads who are so beautiful and don't know it? All the guys are falling all over them and they never notice. Well no worries here. Sheila is an Irish beauty queen who is aware of her beauty and attempts to use it to move her forward if she has to. But she soon finds that it doesn't always get her where she needs to go...where she dreams of going, especially in a time of war. She must decide whether she will become like her moody and bitter mother or someone else. Someone stronger. 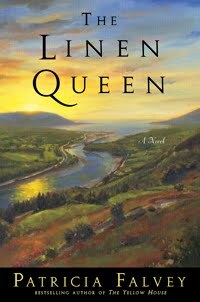 The Linen Queen is an interesting read. At first I didn't like it because Sheila was so unlikeable. She knew she was beautiful and even expressed feelings of entitlement based on it. As the book went on and she began to grow as a person, Sheila began to grow on me too. The love triangle is definitely present but doesn't take center stage. I loved the picture that was painted for me and thought this was extremely well-written. I didn't find myself attached to the character and felt like all of them could use a bit more depth. Specifically, each character seemed to fit a particular role/stereotype and they didn't seem to venture out of those lines. The exception, perhaps, is Sheila...if you buy that she has changed and truly learned a lesson. As a reader who really enjoys characters and their development, this book was good because I enjoy WWII fiction and I really felt I was in the world that was painted for me. Anyone read this book? What did you think? I made a lot of comparisons between Sheila and Scarlett from Gone with the Wind. Wartime and selfish imperfect characters, but for some reason Scarlett really did it for me where Sheila...didn't. Thoughts?